In the 12th round of this spellbinding fight, Deontay Wilder looked at Tyson Fury on the canvas and told himself: "It's over." As Fury lay stretched out, Wilder's people began surging towards the ring steps to proclaim knockout No 40 for America's heavyweight champion. Fury seemed to be in the land of nod. An hour later, Wilder addressed a room of reporters and said: "Only God knows how he got back up." If people are drawn to boxing (a mostly crazy sport) for one reason, it's to see life reflected and enacted in the ring. The legalised violence is an exercise in survival and overcoming. Long before he came to Los Angeles, Fury already had a story to tell of perseverance in the face of daunting odds. "I was on the brink of suicide, and I came back," he said after Saturday's epic encounter. Here he added a second resurrection - in round 12 of 12. "I really thought I had him out of there because I hit him with the right hand and followed with a left hook. Everyone knows I have heavy hands and I hit hard," Wilder said. "I literally seen his eyes rolling in the back of his head. I seen Jack [Reiss, the referee] on the ground with him, checking him." Then those words filled Wilder's head: It's over. There may be better ways to parade the indomitability of the human spirit than being punched to the floor and rising again, but boxing offers the quickest route in sport to convey the message. Twice now, Fury has challenged for world titles abroad, in Dusseldorf and now Los Angeles, and come away with more than most of us expected. "I rise to the occasion," he said. "Something deep down inside me makes me the man I am." "The man I am" is a phrase that requires an acknowledgement of Fury's homophobic and anti-Semitic remarks from 2016. It also asks us to hold out the possibility that people, with the benefit of reflection, can move beyond offensive viewpoints and self-correct. None of us can know if Fury will make those kind of comments again, but he has not made them since, and is sincere in his wish to represent sufferers of mental illness. So we can judge him today on Saturday night's bout for what it was: "A fight that you want to see again," as Fury's promoter, Frank Warren, called it. 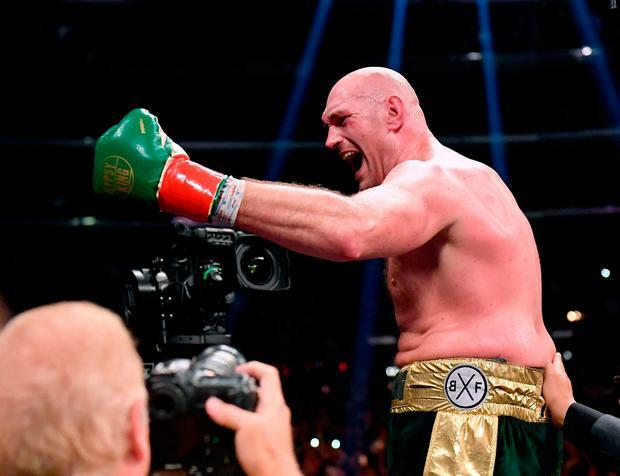 Two years after he was disgraced, and with a drugs ban behind him, Fury emerged here as a strange kind of inspiration to an audience far greater than the Staples Center crowd of 17,698, at least half of which was British and Irish. Buster Douglas, Lennox Lewis, Michael Spinks and Earnie Shavers were among those in the crowd to see Fury evoke the great recoveries of the 1960s and 1970s when fighters in the heavyweight golden age regularly defied concussive blows to climb to their feet and fight on. Why? Because they had to. They were fighting for their livelihoods. Carrying on was much less scary to them than surrendering. The big-fight purses are larger now, but still Fury faced a choice. Over Wilder's promoter, Shelley Finkel, who "ran to the corner" in the 12th, thinking it was over, said of Fury: "It would have been easy to say, 'I don't need to get up', but he got up." Warren was probably right to say of his man: "On home turf, he'd have won that fight." Fury, while aggrieved, knew he had escaped an ignominious end and initially accepted the outcome but changed his mind yesterday morning: "I have never seen a worse decision in my life. It's stuff like this that gives boxing a bad name. "I'm the lineal heavyweight champion of the world. I ain't just going to lay down because I got punched in the face and knocked down. I'm going to get up and fight." There was no dissent when he claimed: "I am a true-bred fighting man." Peacekeeper was another role he added to his repertoire of weight-loss expert and comeback king. After the draw was announced, he defused the tension in the arena: "I was telling my brothers and my family to keep quiet. There were about 8,000 Travellers and Brits. Ten thousand. They probably would have smashed the ring up if I'd instigated it. "I just wanted to be an ambassador for my country and my people. I'm a realist. I thought I won the fight. I thought most people thought I won the fight. I'm not going to cry over spilt milk." Foremost among his missions is to light that trail for people with mental illness, though not everyone can achieve what he has (and so should not feel under external pressure to do so). "There weren't a lot of people who thought I could come here and box like that," Fury said. "Two-and-a-half years out of the ring. It's not any secret what I've been doing out of the ring. "I've been living like a rockstar, but that ain't great, by the way. I fought back from suicide and depression and mental health and anxiety, and I wanted more than anything to show the world it can be done."